Later, another foreigner decided to open shop, in what was described as a competitive business. The history of Love’s Bakery began when Robert Love, a baker and a native of Glasgow, Scotland, disembarked in Honolulu harbor. He and his wife and their three sons (Robert, Jr., 15; James, 10; and William, 8) had made the 80-day voyage aboard the “Adirondack,” an American ship making its way from Sydney, Australia, arriving in Honolulu on June 19, 1851. Less than a month later, on July 12, 1851, the Ministry of the Interior issued Robert Love a retail store license permitting him to operate a bakery and sell its products. 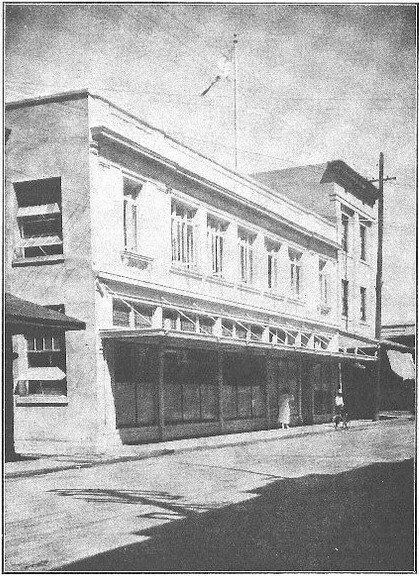 In 1853 Robert Love purchased property on Nuʻuanu and Pauahi Streets and opened the first Love’s bakery there. During the 1850s, the principal income of the bakers of Honolulu – including Love’s Bakery – came from re-baking ships’ bread which had become unfit for use during long voyages, and from re-provisioning ships’ stores with hard biscuits known as hardtack, pilot bread or navy bread. A decade later, Love developed the Saloon Pilot cracker by adding shortening to the hardtack recipe. And, as the name suggests, this new delicacy could be served in the captain’s mess. It remains a crowd favorite. Robert died July 11, 1858; sons Robert Love Jr. and James Love were the administrators of the Estate of Robert Love. The family continued to run the business, with Robert Jr, following his father’s training, taking the lead. (Robert Jr also served on the Fire Department’s Engine Company No. 2.) William died on December 12, 1878 and the remaining brothers split his share in the company. James retired from the business and sold his interest to his brother in 1883. Robert Jr. died later that year and his wife, Fanny, took over responsibilities of the bakery and their eldest son, James Henry, was working and learning the business, occasionally under the name Fanny Love’s Bakery. Tragedy nearly struck again in 1886. The Chinatown Fire of that year started just down the road from them on the corner of Hotel Street and Smith’s Lane. While the 1886 blaze destroyed eight blocks of Chinatown, their property was saved. “A vacant lot between this (burning buildings) and the bakery proved a valuable neighbor to that establishment, the bakery suffering but little damage, being at work again next morning.” (Daily Bulletin, April 30, 1886) It was spared in the 1900 bubonic plague Chinatown fires, as well. On March 19, 1924, Love’s built a new bakery in the Iwilei district, on what was known as the Oʻahu Prison property. The formal opening of the new bread-making plant was held on March 19. While the original Nuʻuanu site continued to produce all types of baked goods, the new Iwilei plant produced only bread and rolls. In July, 1943 the company opened a new plant at 836 Kapahulu Avenue. (This is now the site of the Kapahulu Shopping Center – anchored by Safeway.) Their 144-foot-long oven baked bread at the rate of more than 8,000-loaves an hour. In 1968, the company was purchased by ITT Continental Baking Company. In 1981 Love’s Bakery was purchased again, this time by First Baking Co., Ltd. of Japan and the company’s name became Daiichiya-Love’s Bakery. In 1990 the bakery moved from its Kapahulu site to its present site on Middle Street. And in 2008 ownership of the bakery returned home to Hawaiʻi when local management purchased the company from First Baking Co – the name changed back to Love’s Bakery. Loves Bakery produces 206 varieties of bread, 70 varieties of buns and rolls, and 14 varieties of cakes; the company’s brands include Love’s and Roman Meal. Love’s distributes about 400,000 loaves of bread each week; Bread brands include Love’s, Roman Meal and Country Hearth; Pastry brands include Little Debbies, Mrs. Freshleys, Mary Ann’s Danishes, Bon Appetit, Cloverhill Snack Cakes, Bubba’s Bagels and Bubba’s English Muffins. Love’s sends about 36,000 pounds of bread products daily to the Neighbor Islands, which represents about 40 percent of the company’s business. Love’s also has seven thrift store outlets throughout the islands. For more than 160 years, generations of Hawaii families have loved Love’s baked fresh in Hawaii products.